When the Indian PM hugs foreign leaders, there may be more to it than meets the eye. Within India, Prime Minister Narendra Modi is known to favor a minimalist hugging and handshaking routine, part of any leader’s campaign template. Left to himself, he appears guarded, stern and aloof. Once he clears Indian airspace, however, Modi transforms. He hugs foreign leaders with an air that seems to go well beyond mere ritual. The pictures of Modi with Japanese Prime Minister Shinzo Abe and Australian Prime Minister Tony Abbott are two vivid examples. But Modi’s diplomatic graph is yet to peak. On January 26, India and the world will see a sitting American president by Modi’s side. Modi’s hugs seem at odds with efforts to improve India’s image as an investment destination for global capital. That kind of pitch is better served by a handshake, which is also more in line with Modi’s image of a CEO-type leader. Handshakes symbolize transactional relationships. But hugs imply promises of proximity, insurance and shelter. 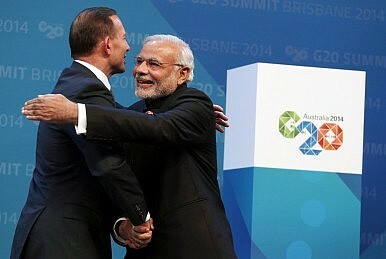 So Modi’s hugs are probably more than just diplomatic niceties. The hugs may be a form of insurance against potential domestic law-and-order challenges, specifically along communal lines. The roots of this hugging hypothesis are perhaps explained by the different treatment world powers and international organizations give to the different ideological formations within the Indian polity. In 2005, the U.S. slapped a visa ban on Modi for his alleged involvement in the 2002 riots in Gujarat. The ban was unprecedented in diplomatic relations with India. For the first time, a high-profile, elected Indian leader was publicly rapped on the knuckles. The ban was not revoked even as Modi continued to win elections in Gujarat, despite the fact that he was never convicted by any Indian court. Compare this with the traditional approach of foreign powers to India’s human rights record. International displeasure is always worded in a way that targets the Indian State. Such rebukes usually do not refer to the political party or leader in power. In 2000, a paper authored by the United Nations University, the UN’s research arm, titled “Human Rights and Comparative Foreign Policy” has a chapter on India. It says: “For example, there were anti-Sikh riots in Delhi after the assassination of Indira Gandhi in 1984, with the clear involvement of politicians in the ruling Congress Party, yet India faced little criticism about this from other states.” So, “Congress” may have been the perpetrator, but “India” was held to answer. What, exactly, made the Congress Party a metonym for India in international circles? This question is worth asking because India’s leader in 1984, who had the power to immediately control the anti-Sikh riots, had insurance against international boycott. One further example of this difference in treatment by world powers is evident in the summary of the “India 2012 Human Rights Report” by the human-rights wing of the U.S. Department of State. The summary said the Kokrajhar riots in Assam initially killed 77 persons and displaced 400,000 from July to September, 2012. But the report did not even question the competence of the state’s chief minister, a Congress leader in his third term, in controlling the riots. Modi’s shaky perch in 2002 was in stark contrast to the Assam chief minister’s position in 2012. Modi had become chief minister a few months before the Godhra riots, and had won a difficult by-election for the Gujarat Assembly, just days before. But American human rights guardians seem to have labored harder to chastise the right wing of Indian polity’s broad ideological divide. It is also worth noting that Modi was given a visa ban three years after the 2002 riots. The Bush administration, which banned Modi, had come to office in 2001. American efforts to protect Indian secularism had curious timing. Worded differently, Modi’s insurance probably expired with BJP losing power in the general elections of 2004. This throws up three interesting questions. : Did foreigners tolerate the BJP only until it was in power in the Centre? Did Congress enjoy an exalted reputation even between periods of rule? Was there a perception, till 2014, that Congress Party will mostly be in power, and non-Congress governments are temporary aberrations of Indian democracy? Modi has perhaps noted the different treatment world powers give to different ideological groups in India. He has also understood there is more to diplomacy than trade and defense negotiations. He has likely calculated the insurance value of personal equations between world leaders, especially against potential domestic complications. Sections in the BJP believe their victory last May was due to low-intensity communal polarization. These sections feel development is an appealing message, not a mobilizing one. The Rashtriya Swayamsevak Sangh (RSS) has agreed to go slow on reconversions, but has not promised to put a complete stop to it. Modi is politically a far more powerful prime minister than his predecessor was. But the forces of Indian politics are perhaps more powerful than he is. An astute strategist, Modi is perhaps working on his international image to insure his legitimacy at home. He is assembling an insurance file, of pictures, which show leaders hugging him all around the world. A foreign leader who hugs Modi today cannot easily denounce him tomorrow. Republic Day may have some exciting visuals. If Modi and Obama hug, the picture may become the cover page of the Indian prime minister’s insurance file for the future. Sampad Patnaik is a postgraduate student of modern Indian studies at the University of Oxford. Prior to that he was a financial journalist with Thomson Reuters.